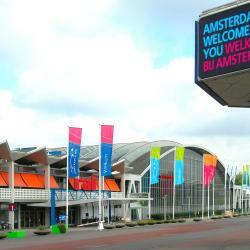 Looking for hotels near EYE Film Institute? Featuring stylish rooms and moorings for recreation boats, Room Mate Aitana is a designer hotel built in 2013 on an island in the IJ River in Amsterdam. PH93 Amsterdam Central is located in the Amsterdam City Centre of Amsterdam, close to Basilica of St. Nicholas. Complimentary WiFi is featured. This houseboat is located just 1148 feet from Amsterdam Central Station. Houseboat Ms 3 Gebroeders offers free Wi-Fi and a terrace. Lively Nieuwmarkt and the Red Light District are 4 minutes by foot. ClinkNOORD is located in the culturally vibrant Amsterdam Noord area, just across the IJ River and about 10 minutes from the back of Amsterdam Centraal Station. This hotel features boutique-style rooms with free Wi-Fi and iPod docking station. It is in the scenic and peaceful Grachtengordel-West district. Perfect service, breakfast was great, room was 10/10. Staff very friendly. Kimpton De Witt Amsterdam is set in the heart of Amsterdam, 984 feet from Central Station. Guests can enjoy the on-site restaurant and bar. Private parking is available on site. Beautifully designed hotel, comfortable beds, big enough rooms and GREAT location. DoubleTree by Hilton Amsterdam Centraal Station combines elegant modern rooms, business facilities with the latest A/V technology, a fitness center and an ideal location overlooking the River IJ and... Perfect location, great staff. Just a 5-minute walk from Amsterdam Central Station, this hotel is set in a monumental building. It offers rooms with double glazing and light-proof curtains. Free WiFi is available. I love where the hotel is located. This hotel in the center of Amsterdam is only 500 ft from Amsterdam Central Train Station. 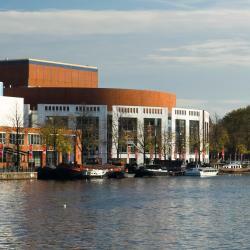 The ibis Styles Amsterdam Central Station features free Wi-Fi in the rooms and public areas. The staff were very accommodating. Located along the Herengracht Canal, Max Brown Hotel Canal District is located in 3 monumental houses with a 300-year old facade. The Brouwersgracht Canal is located just around the corner. Perfect location to explore the canals and Joordan off the city center. In the lively center of Amsterdam, Hotel Luxer has free Wi-Fi access to its guests. There are many restaurants and bars in the direct surrounding of the hotel. Location to the center and the proximity to the central station. Hotel Prins Hendrik is located in a characteristic Dutch city house, across the street from Amsterdam central station. It offers convenient accommodations and a free breakfast every morning. Great place to stay, just a short walk from train station. Breakfast was great.. 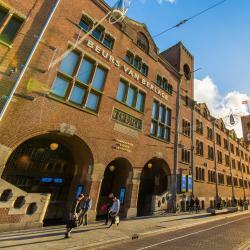 The Renaissance Amsterdam Hotel has a central location near Amsterdam Central Train Station, a 10-minute walk from Dam Square. Family room great. Location excellent. Staff very helpful. Breaugood. 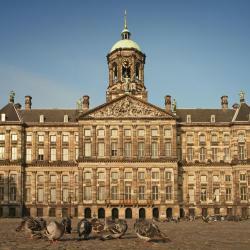 Park Plaza Victoria Amsterdam is located in a historical building opposite Amsterdam Central Station. It features an indoor pool area, sauna facilities and a fine-dining restaurant with city views. Lots of positives. Nice room size and décor. Location was extremely convenient. Right next to the Koepelkerk, this quiet hotel is set in 3 renovated 17th-century houses on the Singel Canal. Amsterdam Central Station is 656 feet away. Breakfast is excellent. A secure, safe, quiet location. NH Collection Amsterdam Barbizon Palace combines modern facilities such as a fitness area with historic features including a 15th-century chapel. our stay was amazing we really loved the hotel it really did exceed my expectations !!!!! Hotels with great access to EYE Film Institute! Hotel CC features modern rooms with air conditioning in 3 picturesque historic buildings. 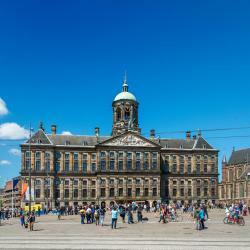 Located in 1 of the oldest streets of Amsterdam, it is 1148 feet from Amsterdam Central Railway Station. I liked everything about Hotel CC. 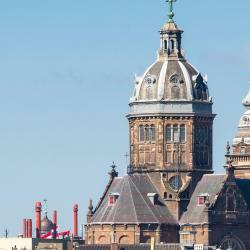 This hotel is located in a historic building just 984 feet from Amsterdam Central Station. Hotel Old Quarter offers free Wi-Fi in the restaurant area and a 24-hour front desk. Views views views!!! This hotel was right on the canal facing the central station. Right in the heart of Amsterdam, Hotel 55 - City Centre provides rooms with free WiFi. Conveniently set in the Amsterdam City Center district, this hotel has a bar. Great location! Close to many restaurants, supermarket and gift shops.